2 WW 1 small cannon dewat rounds. One is U.S. 1918 dated overall 7" X 1 3/8". The second round is German 1917 dated. Both are empty without primers. 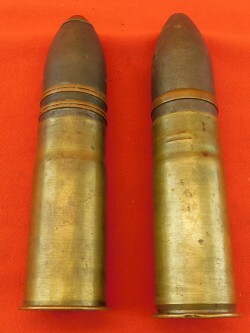 Nice pair of WW1 shells. 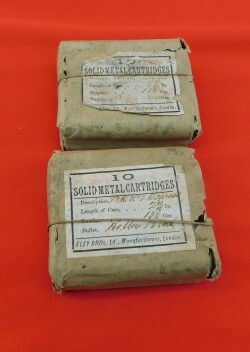 Lot of 2 interesting military cartridge boxes. 100 round count, all old commerical 38-40 cartridges.All factory loads by Winchester, Remington and Dominion CIL. Some show solid lead bullets;others show copper and or white metal banded bullets. Lot of 6 collector box all built by Gevelot Canada located in Saskatoon, Sask. 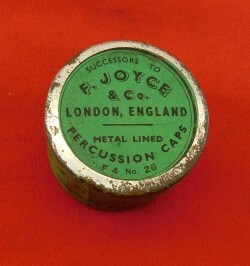 Sealed tin of 250 F4 No 26 percussion caps. The top label is F Joyce London . The green paper labels remain with only slight staining. 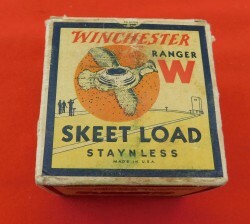 Excellent tin for a cased item. Shipped by Canpar only. 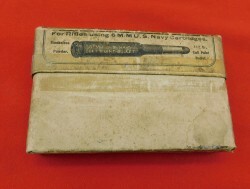 A very scarce (if not rare) full box of 6MM U.S. Navy cartridges . This box is U.M.C. 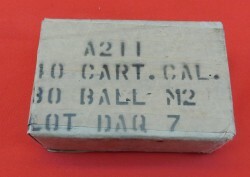 Excellent plus boxes of Dominion (CIL) 22 LR, marked on the top and two sides property of D.D.D. 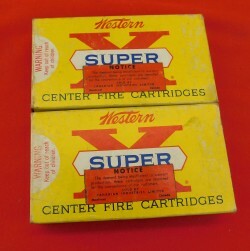 Lot of 2 boxes of Western 220 Swift, 40 original factory cartridges 48 GR PTD soft point. 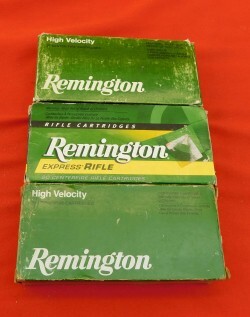 Lot of 3 boxes of Remington 444 Marlin. 24 gr soft point. All excellent condtioin. Boxes are a little shelf worn. 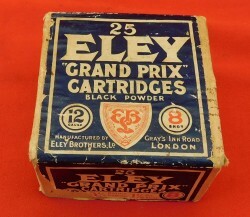 Excellent original factory rounds. 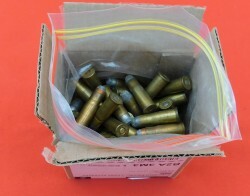 60 cartridges. 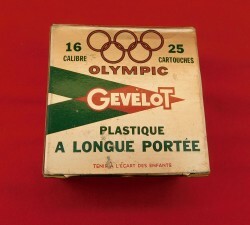 Scarce box of Canadian Gevelot 16 gauge, full original cartridges, pink, green and red box. 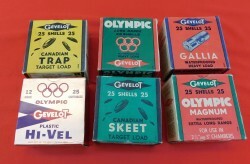 All cartridges are mint with the Canada head stamp. Bilingual label-Saskatoon SK. 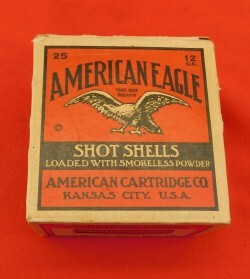 One lot of 37 Boxes of 25 cartridges, 32 auto. All commerical non corrosive, 7.65 NNY 81. The boxes remain in sealed excellent condition. 900 rounds total. A great lot for the 32 auto (7.65). 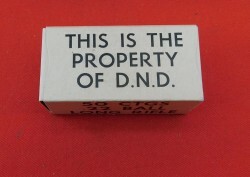 Excellent plus box of US cartridge Co 6.5 Mannlicher Schoenauer. 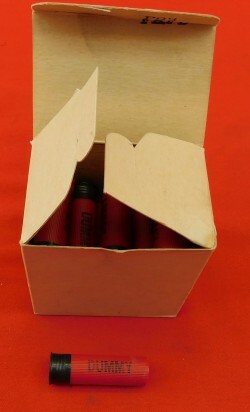 The box shows all of the red printed label on the top and ends, as well as the front face label. The cartridges are all original.